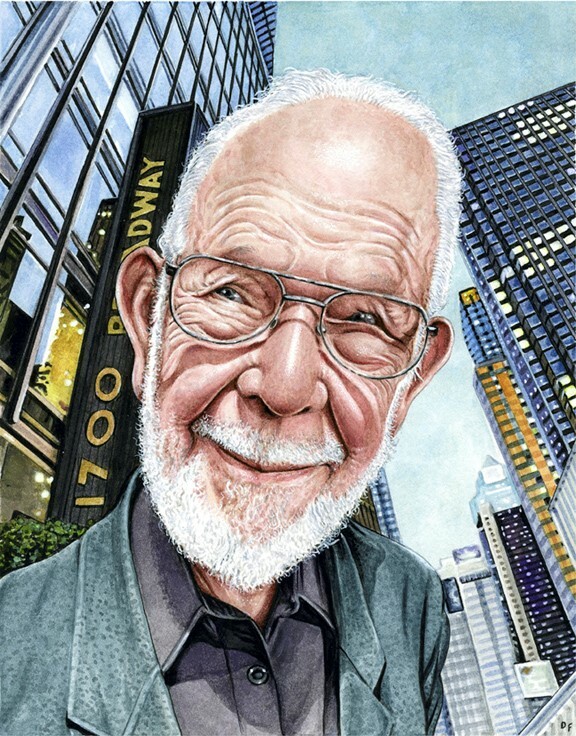 Al Jaffee Exposition | Remembering Litvaks, Inc.
Al Jaffee is best known as the American political cartoonist who has contributed to MAD Magazine since the 1950s. Al was born in Savannah, Georgia, in 1921, but from 1927 to 1933 he lived in Lithuania, primarily in his mother’s native town of Zarasai. His mother was murdered there in 1941. Al has never returned to Lithuania. A few years ago, Al’s friend, Mary-Lou Weisman, asked Al if she could like to write a biography of his life. Al, accepted on the condition that he would create the illustrations. In the book, which was published in 2010, half of the illustrations reflect his memories of his memories living in rural Lithuania. Since Al never returned to Lithuania, all of his images of life in inter-war Lithuania are unaffected by subsequent events and changes. In 2013, Phil and Aldona Shapiro donated copies of the book to the regional historical museums in Zarasai and Rokiškis and to the library of the U.S. Embassy. 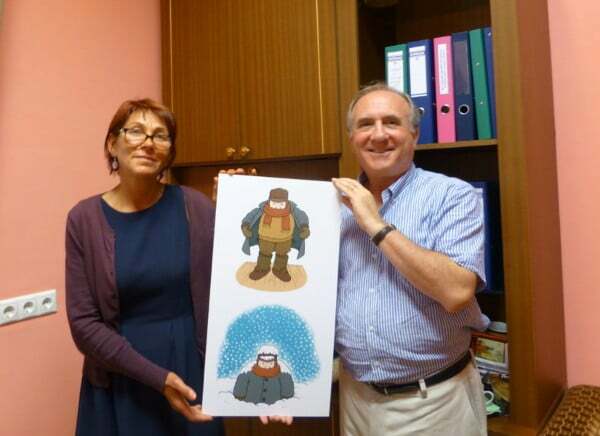 In March 2016, the director of the Zarasai Regional Museum, Ilona Vaitkevičienė, asked Aldona if arrangements could be made to create a collection of posters of the images in the biography pertaining to Al’s childhood years in Zarasai. This request was presented to Remembering Litvaks, Inc., which agreed to obtain the necessary copyright approvals and to sponsor the project. In 2017, the collection of posters was exhibited at the Molėtai Regional Museum and the Ukmergė Regional Museum. In 2018, the collection was exhibited in Dusetos and at the Vilnius Jewish Public Library. The posters were created by Petras Jurkštas of the Vilnius-based “NeoStandartas” print-design studio. 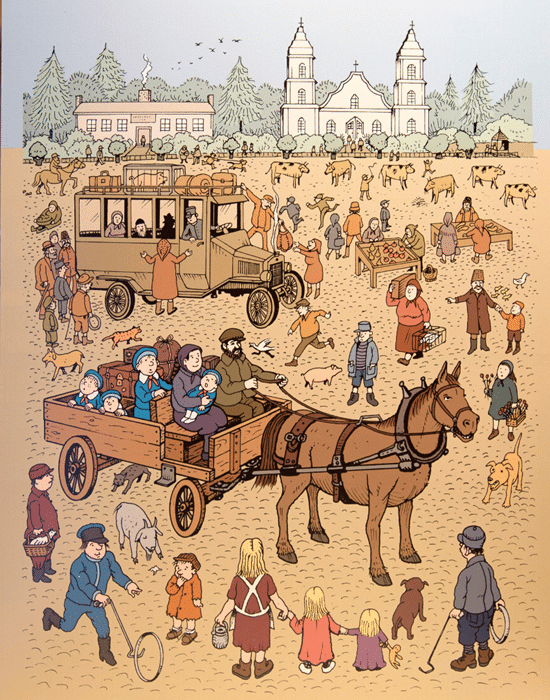 This drawing depicts Al Jaffee’s memory of the day in 1927 that he (standing in the cart) arrived with his mother and three younger brothers in the town square of Zarasai (then, Ežerėnai). Since Al had not returned to Lithuania since he left in 1933, his memory of the square was not influenced by later changes. In 2013, the people of Zarasai were delighted to see his images of the town from the inter-war period. 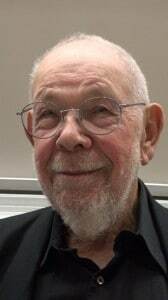 In September 2017, Professor Samuel D. Gruber, a prominent American art and architectural author, historian, and historic preservationist, viewed the Al Jaffee exhibition in Ukmergė. He posted his impressions on his blogsite. Drew Friedman, an award-winning American cartoonist and illustrator, created this expressive tribute to Al Jaffee. © Drew Friedman. All Rights Reserved.